There is a wealth of tracks and trails through the Carpenter Lake area on which you can ride your all-terrain vehicle (ATV). These are shown on the Fishing and Recreational Map (see Fishing) and lead to distant lakes and scenic places. The dominant type of soil over which the tracks pass is a boulder till left by the glaciers and this generates an adventuresome and bouncy ride. Many people use ATVs to reach remote fishing lakes. 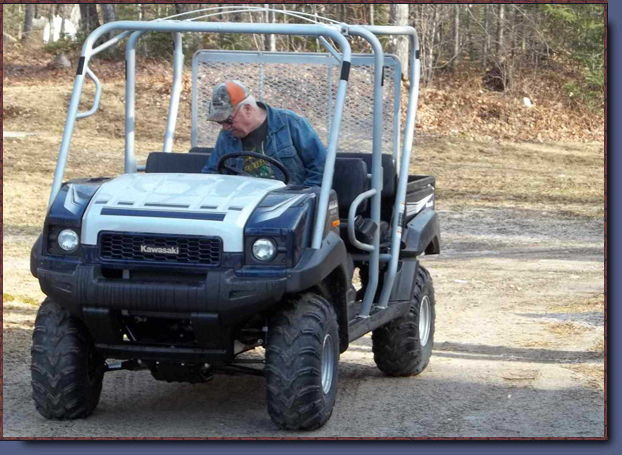 We have a 4-seater ATV that can be rented to take groups on fishing trips and tours. ATVs typically have tires with aggressive treads and can be destructive of the ground and plants. Special off-site parking is available for ATVs. All-terrain vehicles cannot be driven to the cabins, loaded or unloaded at the cabins or parked at the cabins.